I haven’t written about Thai noodles for a long while because it’s getting hot here in Manhattan Beach and I don’t want to eat noodles as much as in winter time. However, I recently made Moo Dang, the Thai barbecue pork, which is an important ingredient in a very popular noodle dish in Thailand, Ba Mee Moo Dang, so I thought I might as well blog about it. 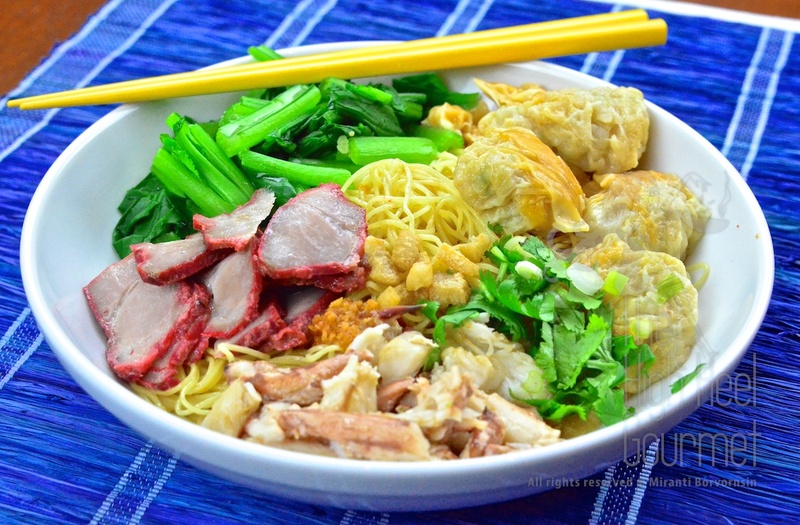 Ba Mee Moo Dang is one of the top five most popular noodles dishes in Thailand. I guarantee that you can find it at every open-air market. It can be sold on a food cart or in a restaurant. You can identify the vendor by looking for the strips of red barbecue pork hanging in a glass case and a pile of yellow noodles. There are two types of noodle servings, as always: the salad style,”hang,” the dry noodles with no soup, and the soup style, ”naam”. I didn’t make the soup kind this time because it’s so hot and I didn’t want to eat hot soup noodles. 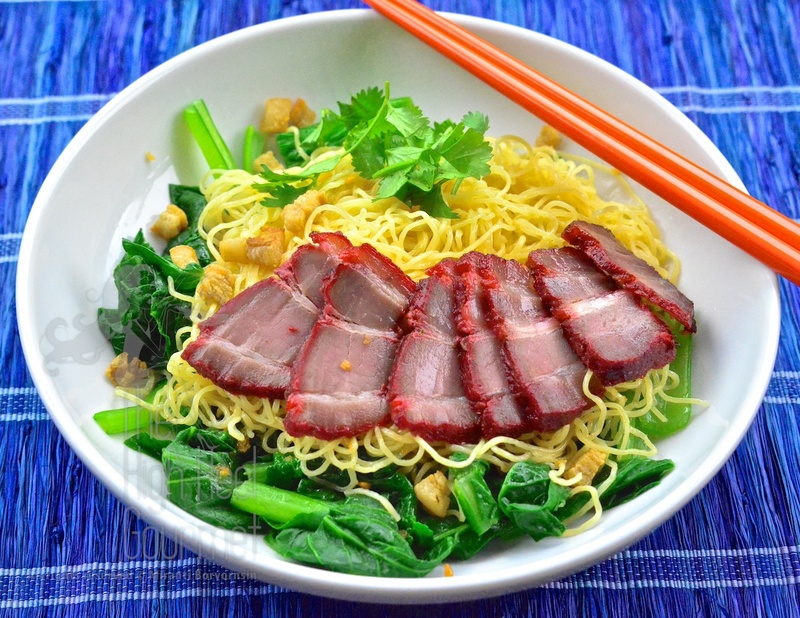 If you want to make Ba Mee Moo Dang with soup, you can go back to see how I make soup for Guay Tiew Moo, the pork noodles, and you can use the same soup for Ba Mee Moo Dang, too. 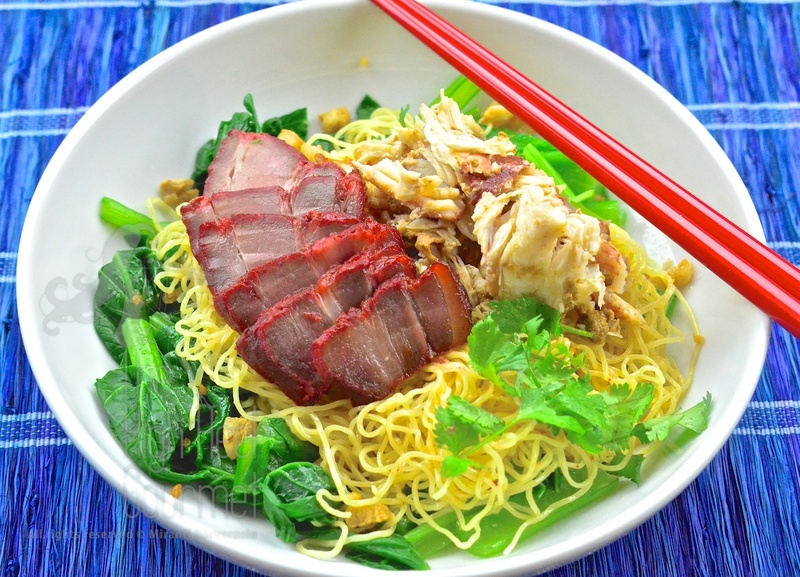 In the first episode of the noodles series I explained to you what Ba Mee is. It’s simply egg noodles. If you can’t find them in your city, you can always make your own. I have a recipe here in the same post with the fresh pasta, the oodles of noodles. 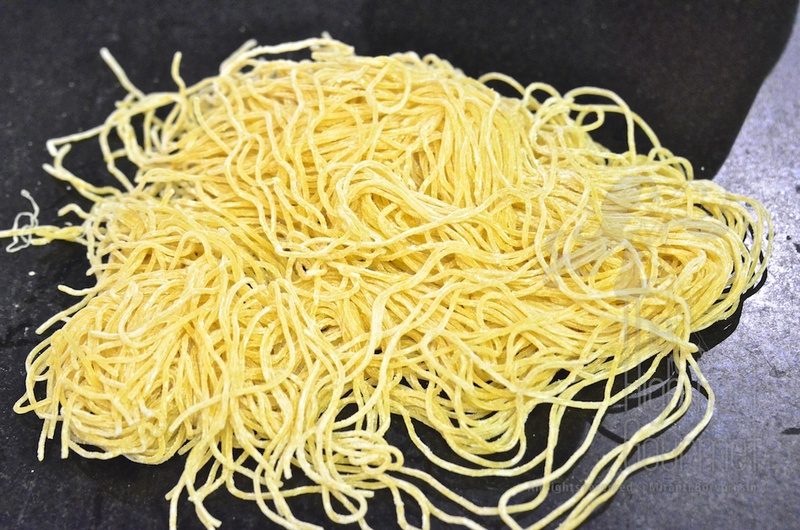 The different between fresh pasta and egg noodles is the alkaline in the egg noodles and the time you “ripen” them. You need to ripen the egg noodles for at the least one night to get the right noodle texture. Two to three nights will make them perfect, bouncy and stretchy. 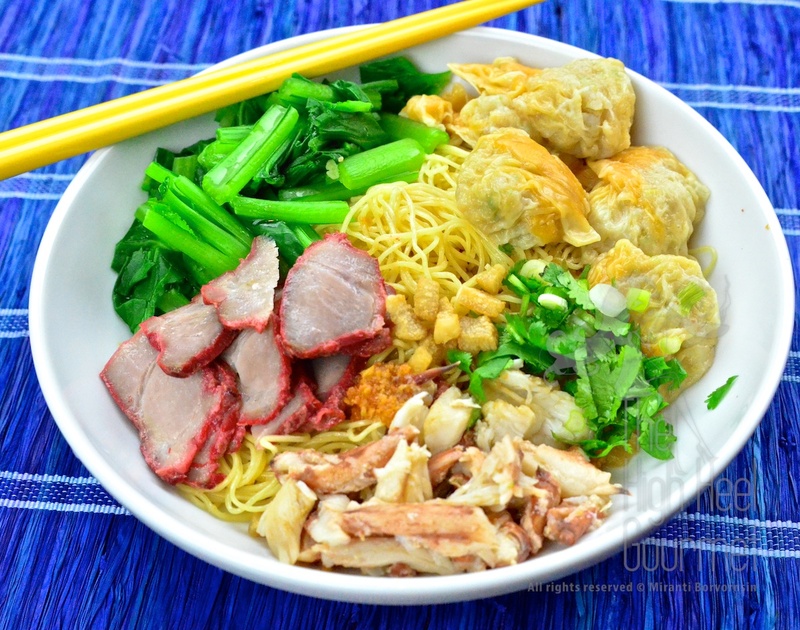 The vegetable used in all Ba Mee Moo Dang in Thailand is called Choy Sum or You-Choy. You can read about it here. It’s not as popular as Napa cabbage or Bok-Choy in the U.S. You have to really go to the Chinese market to get it. If you can’t find it you can use Bok-Choy, which is more popular and you can easily find it in the regular market. I like the crunchy earthy bitterness of Choy Sum more than the bland taste of Bok-Choy, so I make the effort to go to the market and get it. 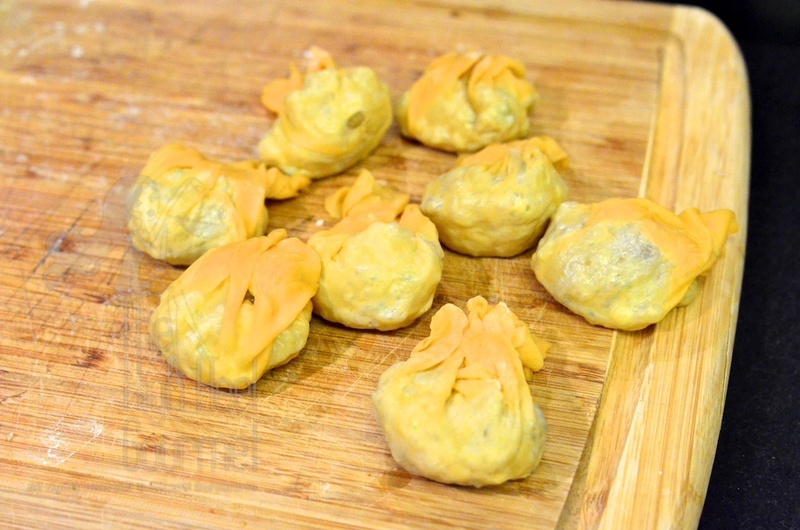 and the shrimp and pork wontons, called Kiew or Giew in Thai. There is a very critical accompaniment that I can’t ignore. It’s the golden fried garlic in oil called Kratiam Jeaw. The reason that this is so special to me is because I get to fry the garlic in pork fat with bits of crispy pork fat pieces in it. You can see how it was made here in Episode II of the noodles series. 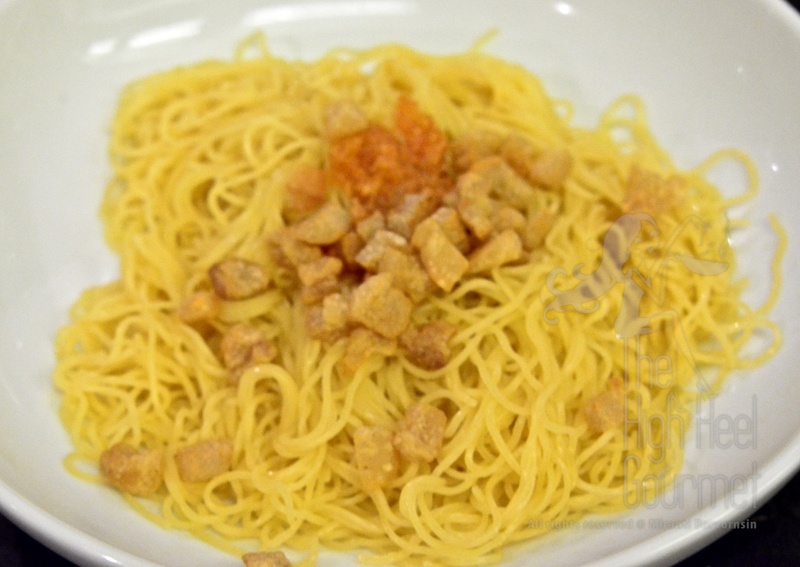 This type of noodles is not supposed to have a lot of condiments like all the others do, so the flavor of pork fat is going to be pronounced and really make the difference to the overall dish. I strongly recommend trying it at least once. You can get pork belly at the market. Normally they’ve already gotten rid off the skin for you, so just cut them all up and fry over medium heat just as you would cook bacon, making sure to collect all the oil to use to fry garlic later. I will start this dish by making the wontons. 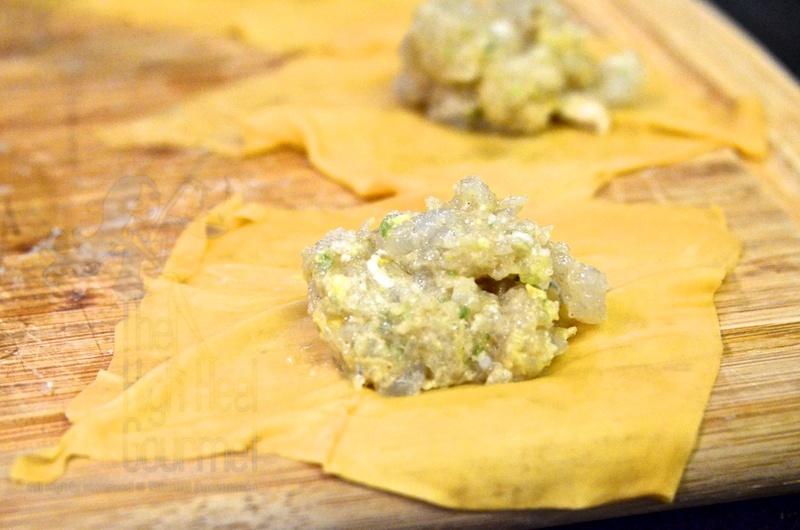 4) Wrap about one tablespoon of the mixture in the wonton skin and close it. 1) Boil about 6-8 cups of water in a deep pot. Prepare another big bowl with cold water nearby. 2) Wait until the water in the pot reaches a boil and drop just one portion of the vegetables in, stirring constantly until the water reaches a boil again. Use a large slotted spoon to scoop all the vegetables out and drop them in the cold water—just a flash to stop them cooking. This way the vegetables will stay green and will not turn brown. You will be doing each serving separately, both the noodles and the vegetables. wait until the water is at full boil and drop one serving portion of the noodles in, stirring constantly, then wait until the water reaches a boil again, lift the noodles out of the water and drop them in cold water and stir just briefly. Take them out and put them in a large slotted spoon and dunk them back in the boiling water—just a flash so the noodles will be hot on the outside but stop the cooking of the inside. This way you will get the noodles that are al dente but hot on the outside. 4) Toss the noodles with golden garlic and the oil to make sure that the noodles don’t stick together. Sprinkle with the bits of crispy pork fat. 5) Add the Barbecue pork, wontons, crab, cilantro, green onion and all other condiments, toss and taste it. You can adjust the taste to your preference. Repeat the whole process for each serving. This entry was posted in All Day, Boil, Chinese, Comfort Food, Crab, Dinner, Lunch, Noodles, Noodles, Pork, Seafood, Shrimp or Prawn, Snack, Soup, Thai, Thai Noodles and tagged Asian, Chinese food, Cooking, Easy recipes, Food, Noodles, Pork, Recipe, Salad, Seafood, shrimp, Soup, Thai food. Bookmark the permalink. Super recipe again! Thanks for sharing it!!! what an epic meal! I heart noodles.